FAMILY RESORT OPERATOR Center Parcs has revealed a glimpse inside the €200 million holiday park it has planned for Longford. The UK company plans to build its first “holiday village” outside England on a 375-acre tranche of land at Newcastle Wood in the midlands county. The resort developer wants permission to build 500 lodges – including several treehouses – a spa, nature centre, shops, restaurants and a “subtropical swimming paradise” on the Coillte-owned site. The release of its detailed masterplan is the last step in a consultation process before the company puts in its planning application. It isn’t expected the venue, to be called Center Parcs Longford Forest, will be open to visitors until 2019. The company’s CEO, Martin Dalby, said today marked a “significant milestone” in the plan to bring Center Parcs to Ireland. It claims the development would bring 1,000 permanent jobs and 750 temporary construction jobs to the region, adding €32 million to the Irish economy each year once up and running. However the company has previously been criticised for doing little to help local economies as guests typically stayed only for weekends and spent all their time on-site. Some 1.7 million guests stayed in its resorts last financial year. 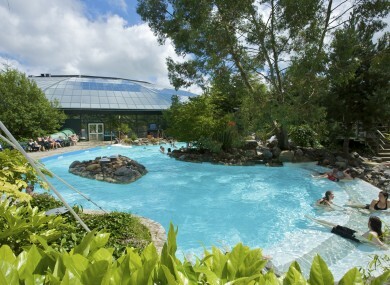 A separately-owned but affiliated company, Center Parcs Europe, operates 21 resorts in Germany, the Netherlands, Belgium and France. Email “Here's a glimpse at what a massive new holiday resort in Longford will look like”. Feedback on “Here's a glimpse at what a massive new holiday resort in Longford will look like”.